Bush, Christie Counting on N.H.
Jeb Bush was in Manchester during the Iowa caucus, while Chris Christie was in Nashua - an indication that the Republican candidates have put all their eggs into New Hampshire's basket. Voters here seem to think it's working. "I think it will help, I think New Hampshire voters expect to be able to meet their candidate," said Sunapee resident Karin Berthiaume. At yet another town hall event, this time in New London, New Hampshire, Jeb Bush tells the crowd to focus on the First in the Nation Primary and not what happened in Iowa. Kasich at Town Halls in N.H.
"You can reset the race or you can let pundits say it's already over," Bush told the crowd of more than 200 on Wednesday. Bush who essentially skipped any organizational efforts in Iowa finished sixth in the caucuses. 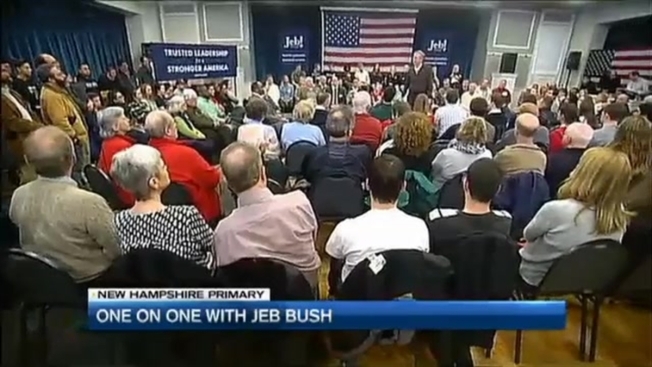 In a one-on-one interview, Bush told necn that there is no such thing as momentum coming into New Hampshire. "Look, my dad had 'Big Mo,' remember that, in 1980?" Bush said. "He had 'Big Mo' he won Iowa and lost in New Hampshire." He then went on to take a not-so-subtle jab at Marco Rubio, who had a stronger-than-expected third-place finish in Iowa. "If people rest on 'Marco-mentum' or momentum, they're going to be surprised because people here they take it seriously, they want you to come and earn your vote and that's what I am doing," Bush said. New Jersey Gov. Chris Christie has a similar strategy, pinning his hopes on New Hampshire and dismissing the caucus results that put him in tenth place and three outsiders at the top of the pack. "There's two different kinds of trucks in this race," Christie told an overflow crowd in Bow Wednesday afternoon. "The Marco Rubio/Ted Cruz truck is the new, shiny, smells-nice truck, then there's the Chris Christie truck, it's old, it's beat up, it's nicked up, it doesn't smell as good as it used to, but man the Chris Christie truck knows how to get out the mud, you know why, cause he's been in the mud before." Next Tuesday will be make or break for Christie and Bush. Political analysts in New Hampshire say they need to finish in the top four to justify continuing their campaigns into South Carolina.